Snack Sucker is one of Ashley's microgames in WarioWare: D.I.Y. and returns as one of Orbulon's microgames in WarioWare Gold. The point of the game is to allow the giant head at the top eat the snacks. However, there is sometimes a hammer or a baseball that the head is trying to eat. The player needs to tap the unwanted items while trying to avoid tapping the snacks. Various snacks include lollipops, chocolate bars, cake, and flan. If the player manages to tap all the non-snack objects and allowing the head to eat everything else, the game is won. 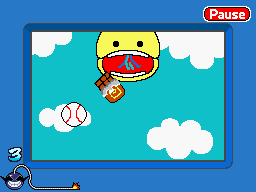 However, if the player manages to tap a snack or if the head eats a baseball or hammer, the head is angered and the game ends in a loss. An alien replaces the giant head and the snacks and obstacles come from the left side of the screen instead of the bottom.